Wing It Vegan: Giveaway Winner and Vegantine's Day Yummies! Giveaway Winner and Vegantine's Day Yummies! We have a winner! Congratulations, Krys at Two Vegan Boys Weblog! Thank the gods for Random.org. It would have been impossible for me to choose only one winner from all the brilliant entries. Krys' superpower was "the ability to feed the world so there were no more starving children." Nice! I hope you and your family enjoy your new juicer, Krys! Just send me an email with your address to wingitvegan (at) gmail (dot) com so I can forward it to the 877MyJuicer.com folks. Thank you to everyone who entered the giveaway. It was lots of fun! Let's talk Vegantine's Day! I wasn't very inspired this time, maybe because we've been so busy getting ready to hit the road. How on Earth did I manage to make so many Halloweegan treats during MoFo? Anyway, let's start with breakfast. 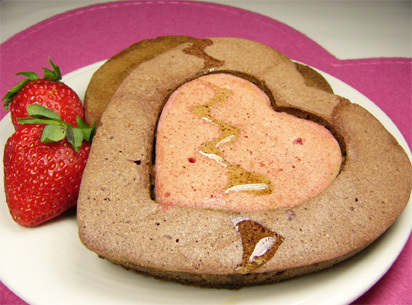 These heart pancakes are made with two metal heart-shaped cookie cutters. A large one for the chocolate part and a smaller one for the strawberry centers. 1- Whisk together the dry ingredients in a mixing bowl. 2- Whisk the liquids in a measuring jar or small bowl. 3- Stir the liquids into the dry ingredients adding more soy milk if necessary. 2- Use a blender to make yourself a little smoothie with the strawberries, soy milk, maple syrup, vanilla, and beet juice. 3- Blend until smooth and whisk in the oil. 4- Stir the smoothie mix into the dry ingredients adding more soy milk if needed. 1- Preheat your skillet prepared with cooking spray. Also spray your metal cookie cutters all around inside and out. 2- Place the big heart on the skillet, place the small heart inside of the big one. Spoon some strawberry butter into the small heart and some chocolate batter into the big heart. 4- Cook for a couple more minutes and carefully flip them over with a spatula and cook for a couple more minutes or until a toothpick inserted in both parts of the heart comes out clean. You don't want to brown them, so the heat should be low and you shouldn't overcook them. 5- Repeat for the rest of the batter. You should wipe clean the cookie cutters and re-spray them with cooking spray in between pancakes. Makes 8 pancakes. * These pancakes were OK. I made them without chocolate chips and sliced strawberries so they didn't live up to their full potential. 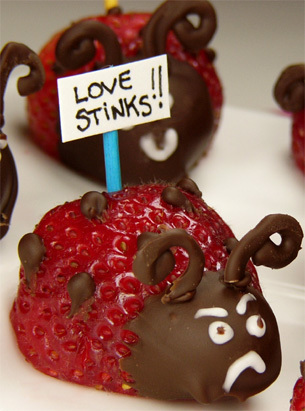 My favorite Vegantine's Day treat - Strawberry Love Bugs! I dedicate these to Denny, my Strawberry-Twin! There must always be a Mr. Cranky Pants for balance purposes. He did not want to have his picture taken. UPDATE: I blogged about these again in 2011. Check out the step by step instructions! These are really easy to make, especially if you leave out the antennae. Just slice a few strawberries in half and dip only the tips of both halves into some melted chocolate chips to create the heads. Use a simple powdered sugar and water icing for the faces, and drop some melted chocolate chips on the little bug's bodies. I cut a tiny hole in the corner of a small ziploc bag to squeeze out the chocolate drops. The signs they are holding are little pieces of paper hot-glued to toothpick halves. That's it! More chocolate? Sure! These are the same chocolates I made for my previous post, though this time I invested $2 in a chocolate mold from Hobby Lobby. Money well spent! 1- Melt the chocolate chips with the coconut milk. I did this in the microwave, at 50% power and a couple of 30 second intervals. 2- Stir in the shredded coconut. 3- Coarsely grind the cashews. I used our Magic Bullet, just a few pulses so they don't become cashew flour! 4- Stir the cashews into the chocolate mix. That's your chocolate filling if you're using candy molds. If you're shaping these by hand move on to the next step. 5- Spread the chocolate on wax paper and refrigerate for an hour. 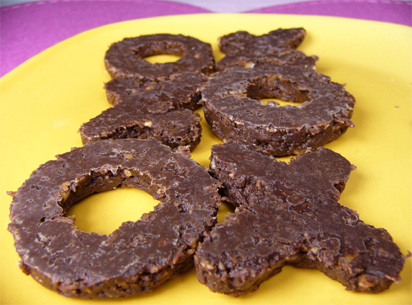 6- Cut into your favorite shapes with cookie cutters. 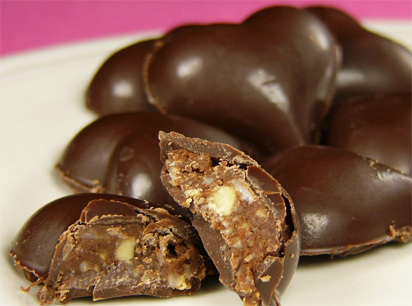 Place chocolates on a plate and refrigerate for another hour. At this point you're done. Unless you want to do some extra work and dip each chocolate into some melted chocolate chips like I did for my previous post. Way too much work for my taste though. Or you can just shape them into balls and make truffles which would be easier to dip in chocolate. Keep them refrigerated! Here they are non-dipped and shaped like hugs and kisses. These were actually Mr. Wing-it's birthday pies. He's not a big cake man. He's a pie man. Vegantine's Day Outtake! These were supposed to be Cupid's Cupcakes, but the chocolate arrows look more like chicken feet. They look like there's a chicken buried in a heart and one of its legs is sticking out. Ugh. When life gives you a Lemonade Award... Thank you so much Jumbleberry Jam for my sweet award! It's so nice to get an award from such a cool blogger like you! I have to pass it on to 10 people, but look at my blog roll and you all will see my predicament. So, I better get squeezin' lemons because I intend to pass this on to everyone on my blog roll! Aww aww aww! River, I don't know how you do it! Every time you post, I think, "This has got to be the best post ever." But then you outdo yourself! P.S. I saw our man Joaquin on the news last night. Yipes! He just keeps lookin worse and worse. Wow!!!!!!! Really!?! I have never won anything. That is so awesome! I am doing the Snoopy happy dance right now. And the Valentine goodies look divine. I love this post!! Those love bugs are the cutest. I want some of all of it for Vegantine's day. Do you think it's too much to ask my husband to make me pancakes, lovebugs, chocolate cashew coconut yummies, mini pies, and cupcakes for me on Saturday? congrats on the award, River! and your post is glorious! full of all kinds of awesome - i don't even know where to begin! the cupcakes are the most fabulous cuppers i've ever seen. hands down. they're too awesome! the mini pies caused me to drool onto my keyboard - and your chocolates! mmmmmmm! they're making me want to get a chocolate mold & get crack'n! mr. cranky pants = my absolute favorite, and i love the pancakes, too! i may have to check out some of those nature's path yummies! 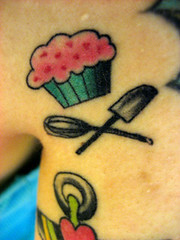 maybe i'll grab some of their granola & make some of your granolicious cupcake-muffins! wahoooooooo! may you have a rock'n valentine's day too, River! And what filling did you choose for the pies? It looks great. Congrats to you, too, on receiving all those Nature's Path goodies! I bet they're all yummy. I'm going to be making the pancakes (although I don't have a mold so I will just use the strawberry idea), the mini-pies, and the granola muffins, HOLY YUM! I'm just dumbfounded after reading about all this deliciousness. I sure did make it to the end! I LOVE your little chicken feet - I mean cupid cupcakes - both hilarious and yummy-looking, how do you do it??! 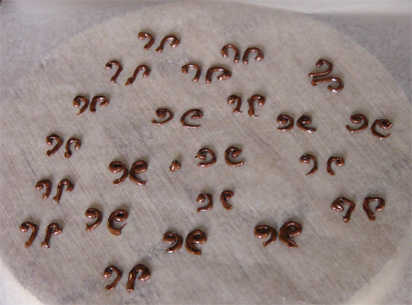 You have more patience than I do when it comes to making chocolate antennae and the like! And I've seen that Nature's Path Gorilla Crunch in our local supermarket - may need to give it a try! Oh I have been overcome with cuteness at those lovebugs!!!! And thank you for the review of the gorilla munchies , I have been eyeing them in the health food store but they are expensive so it's good to know they are tasty! WOAH! Hold up,how is it that you've comcocted such fantastic, adorable valentines day recipes, all on your own!? River, you seriously need to write your own vegan cookbook, I would SO buy it! You always come up with the best Holiday treats. The love bugs are so adorable! The cashew-coconut yummies sound fabulous too. I love anything with coconut in it. I just may have to make these on Valentine's Day. You're so lucky you got a boat load of free Nature's Path goodies! I'm back to stalk your blog again... and this time I've brought my mommy with me! the pancakes and the love bugs are SO creative!! This post was such a pleasure to read. Hope you and Mr. Wing-It have a fun Valentine's. Everything in this post looks so amazing - even the chicken feet! :P It was a great idea in theory, at least. I discovered Nature's Path recently, and I LOVE Pumpkin FlaxPlus Granola. Can't wait to try your recipe! All of your food is so cute!!!!! I need to make the cookie hearts...and everything!! I love how your recipes don't require difficult to find ingredients...that's a relief for someone who lives in Mexico (that's me haha). Thank you for sharing all those amazing recipes. First of all, congratulations to the winner of the giveaway!! So fun!! 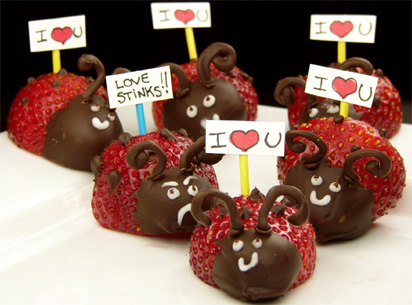 All your foodstuffs look so yummy, especially those most adorable strawberries ever! Fabulous, as always! Love your little grumpy-pants bug-so cute! I just bought some cute heart chocolate moulds so I'm excited to try your cashew coconut combo. Yummy! And, I'm so excited to know your b-day is Feb. 28--mine is the 27th! yay! Happy Vegantine's Day! Damn, girl! What an amazing drool-worthy post! My favorite of all is Mr. Cranky Pants Strawberry Bug. He is so cute!!!! OMG - I just love those little strawberry lady bugs! While I was reading your post, I think my mouth was hanging wide open in amazement!! If only I was as good of a bakestress (hehe) as you are, I'd make all those wonderful goodies!! Those ladybugs are just too much! Not only are they adorable and look delicious, but they have personalities!!! WOWZERS! River I love everything! You just keep on amazing me, you are my blogging hero! I will be making those beautiful pancakes for my T.V on pancake day, they wont look as lovely as yours though. Strawberry love bugs~ these are TOO MUCH! So freakin' cute, particularly Mr Cranky Pants, who is of course my favourite! It's the simplicity that makes these genius. I LOVE THEM! Chocolate hearts~ awesome. Special kudos for these as the ones I tried to make in a heart shaped ice-cube tray failed royally! (the chocolate went speckly and they looked like they had the plague! Eep!) And the hugs and kisses are an equally awesome bonus! And thanks for the cereal review, we get the Gorilla Crunch stuff over here but I've never seen the others. I will keep my eyes peeled for the rest. River!!!! There is too much amazingness in this post woman! I'm on amazing over-load! Congrats to Krys because she is just the coolest ever and totally deserves some fresh juice to keep up with her kiddos! I love all your Nature's Path goodies! Kari should be sending me some goodness soon - and I can't wait! I love it when there's a holiday coming up as I know you're gonna post a buttload of awesome themed food and you didn't disappoint! Firstly - chocolate pancakes – mmmm! I LOVE your strawberry lovebugs. Especially Mr Crankypants! He has my cranky single person’s attitude to vegantine’s day as well. The heart chocolates are gorgeous. Totally professional looking they are. 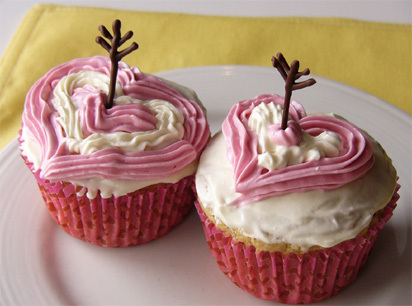 Haha I love the chicken feet heart cupcakes – they’re adorable. The granolicious muffins look great, I like the idea of putting granola on top of muffins! The cupcake liners are so cute too. Those ladybugs are the best! I love ladybugs. Also, I think I will now have to figure out how to make strawberry pudding. I am so glad Krys won the juicer! She is so amazing. And has love bugs too! I'm just LOVING this post River - so many adorable goodies. The love bugs are just awesome beyond words especially Mr Cranky Pants. And those Pies are just begging me to eat them. Oooh and I LOVE the Chocolate-Cashew-Coconut Yummies. They should be in my tummies. Congrats on your award and can I say I'm so glad Krys won. mmm, so many yummy treats! those little bugs are adorable. okay this wins.. cutest post EVER!! I absolutely love the chicken feet. Hilarious. Meanwhile, you amaze me how much you do in a week, all keeping it so cute. You're epic! Enjoy Valentine's with Mr. Wing It. Thanks for sharing the Nature's Path review. I've tried some of their products, and now I am eager to try some more. Oh My God.. I don't even know where to begin..
Everything looks just amazing. Love the cashew chocolates the most I think. About coffee.. I maybe be gearing up to give it up. For now, I've been drinking one small cup a day.. I don't want to give it up! Everything looks amazing, especially those strawberry bugs - I like Mr. Cranky-Pants, just to keep things honest :)- so much good stuff here, I wish I made sweets/desserts more often. Happy valentines day! you totally rock! I can't believe all of the valentine goodies you made. I just love mr. crankypants. Is he cranky because he's too cute for words? Definitely bookmarking though so I can try those coconut chocolate hearts. And the lovebugs are so cute! I Loveee all of your vegantine's day goodies! everything looks so cute and delicious. I went out and bought coconut milk just so I could make your chocolate coconut cashew yummies and I am sooo excited to eat them! Wow! My favorites are the mini pies and the granola muffins. I'm going to try to make them soon! Thanks for the post. you are amazing! WOW -- everything looks so good and perfect-- like it belongs on display at a swanky cafe! I really want those bugs! I LOVE strawberries!!! & so jealous of your nature's path loot - they make so many great cereals and snack bars. What a fun-filled post full of awesomeness! The pancakes look great, and the love bugs are super super cute. Haha, I think the arrows on your cupcakes look like little leafless trees, which is fine too. How cool that you got to sample Nature's Path stuff! I never stress when choosing one of their cereals, because every one I've tried has been reall good. I always seem to go back to the Optimum Power cereal. Lol, I love Strawberry Love Bugs! Your strawberries are too cute. And I've gotta try those granola muffins--my husband eats the Red Berry variety of that granola every day, so maybe I'll sub that. What a great site you have! I love the photo of you and the horse. I have just discovered your blog so I will have to try some of the recipes. I think I am in love with your Valentine pancakes and your strawberry love bugs. Also thank you for the cereal review, I have seen those at the grocery store but I am hesitant to try new cereals. I would much rather try something that I know that someone else likes. How did I miss such an awesome and ginormous post? Everything looks adorable and yummy, as always! You are the Vegantines queen!! The whole thing is weird, and I really hope he's just doing this for publicity for a role, and not because he's on drugs or something. Whoa! I am totally overwhelmed by your post! Your pancake photo is awesome! Not very inspired, are you kidding? This post is amazing! Those strawberries are adorable and everything is fantastic, as always. Congratulations to Krys, a fellow Texan I believe! ohh...you've got the love bugs..and I want some!! I totally got that those were arrows, not chicken feet..very cute! You're so talented river! River, I want to celebrate the next Valentine's Day with you. These are the most amazing ideas I've ever seen. Aw, those bugs are too cute! And omg, I don't know where to start on commenting on your Valentine's Day treats! They all look delcious but I esp. love the strawberries! Those love bugs are way too cute to eat! Those strawberries are just too cute!!! Seriously, you are always so creative! I have some granola, so I'm totally going to make those muffins! How did I miss this post?! Those strawberry bugs are the most cutestest!!! And those granola muffins, holy freakin' crap. You are my hero. Seriously. You are crazy! Heart pancakes, pies, cupcakes?! When do you have time to eat them all? hehe. Also, I love the FlaxPlus cereal, just the plain one. SO good. heheheheh awwww sweetheart! i am giggling with delight! awww i love my lovebugs! Thank you Thank you thank you! You're just as amazing and all the supah doopah things I already think of ya! I've got friends coming into town and I'm going to make the strawberry pancakes for breakfast tomorrow. I'll be sure to take pics.